By signing the entry form, the artist acknowledges that he/she has read, understood and agrees to be bound by these Conditions of Entry. Membership fees to Sculptors QLD, must be paid before submitting an Entry Form to the Exhibition. Entries will only be accepted if membership is current. Membership Fees are due and payable before 28th February 2019. Late payment will result in an increase by a further $20 for payment after this date. Visit http://sculptorsqld.org.au for Details. Every Member who enters art work, is required to assist with the running of the Members’ Exhibition, in regard to preparation before and/or during the exhibition. Please state your availability at the appropriate page on your entry form. A Roster will be formed, and you will be notified. We will endeavor to give you your first preference however this may not always be possible. Each Artist may enter up to a maximum of three Indoor pieces and three Outdoor pieces. Each entry must not have been previously exhibited in any annual Indoor/Outdoor SQ Mt Coot-tha Exhibition and works entered must not have won an award/prize in any other art competition. All artwork must be original, solely the work of the artist, and completed in the 2 years prior to the date of the Opening night of this Exhibition. Multiple editions should be clearly marked with an edition number. A new edition does not mean a new sculpture. Indoor pieces must be able to be lifted by two people. the artist’s permission for such Reproduction. A fee of $30 is charged for each sculpture entered. Due to space in the Auditorium, if too many entries are received, a refund will be given, if your 3rd piece cannot be exhibited. All artwork must be for sale and the total price must include GST (if applicable) and commission of 20%. Payment for sale of work will be made to the artist within 2 months after the closure of the Exhibition by EFT to the artist’s bank account. Large sculptures to be exhibited in the Gardens must have one measurement greater than 80cm and be securely fastened to the ground. Dimensions and weight must be clearly stated on Entry Form where required. Smaller robust outdoor sculptures are permitted but will be exhibited in the Bromeliad Enclosure for safe keeping a well as the fern garden. 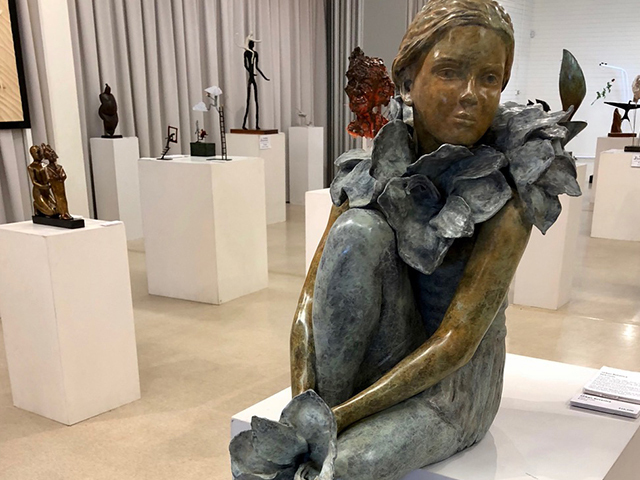 Sculptures for the Outdoor exhibition are to be installed, exhibited and removed by the sculptor in accordance with the Gardens’ approval or direction of Gardens staff. If on installation, a sculpture is deemed unsafe by Gardens management, it is to be made safe or removed immediately upon the sculptor being notified before he/she leaves the site. Thursday 16th May from 9 –12am is allocated for installation of Outdoor sculptures. Mt Coot-tha Gardens will only accept work installed at this time. This is not negotiable. Staff will not be available to approve the installation of work outside these hours. Depending on the number of sculptures entered for this year’s Exhibition, we may have to negotiate installation over 2 days. You will however, be notified about any change to the current procedure. The final location of each Outdoor sculpture will be as directed by Mt Coot-tha Gardens staff. All sculptors are required to sign in at the Administration Building so that the Head Gardener can be informed of arrival. Should your vehicle be required to drive into the Gardens, you must be accompanied by Gardens’ staff. Any concerns or questions the artists may have before or during installation must be directed to the Exhibition Coordinator for SQ, who will be in attendance. Artists shall not consult with Garden staff directly, unless instructed to do so. The safe installation of the work is the responsibility of the artist. All outdoor sculptors are requested to have an excellent system of stabilising their work that has been tested beforehand. The artist is to ensure that the work is appropriately secured in position, does not encroach on pathways and is not in any way attached to plants or signage. be liable for any damage or loss to sculptures. on display. Any damage that may occur is the responsibility of the exhibiting artist. Artists exhibiting sculpture on the lagoon must provide their own means for installing and anchoring the work. This may include inflatable or rigid water craft or waders. An ‘invitation only’ extended Outdoor exhibition will be available for 3 months to selected artists with approval from Mt Coot-tha Gardens management and the SQ Exhibition Coordinator. All Indoor and Outdoor Sculptures must be removed on the agreed date. Artworks that are not collected when required may be deemed by the Committee to be a donation to Sculptors QLD and may be removed and disposed of by the Committee as it sees fit. Should any dispute arise for which no specific ruling has been laid down, the committee’s decision will be final, and no correspondence will be entered into.